Flipboard for the iPad is one of those apps that shows off why it’s great to be an iPad owner. It’s a social magazine that opens with a wall of feeds of your choosing (including Twitter and Facebook) as well as aggregated feeds put together by the folks from Flipboard, and other news feeds. You can have up to nine total feeds on your home wall. The thing that sets apart Flipboard from most other news aggregating apps is in the way it displays the information to you. For instance, you can sign-in to Twitter and Flipboard will show your timeline and format it in a newspaper fashion. You might be thinking, how can they do that when each tweet is only a max of 140 characters long?! The secret is that if a tweet contains a link, as so many tweets do, Flipboard will pull the content of that link and stream it into your Flipboard feed. The benefit here is that you don’t have to click the links yourself. As you flip through the pages of your timeline, you’ll see a much better summary of content than if you were skimming through your timeline. The same concept applies to your Facebook feed and works very much the same way. The main difference being that Facebook media such as photos will be displayed as well. 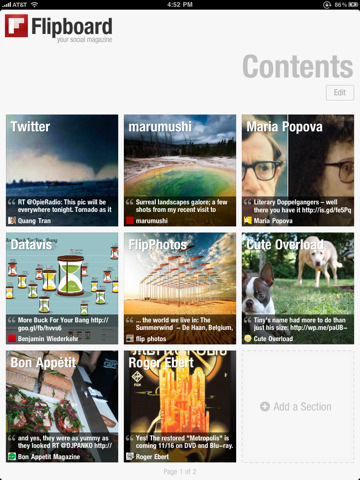 So what makes Flipboard a social magazine? Aside from pulling in your timeline from Twitter and your Facebook friends’ posts, all the news articles it aggregates in the other feeds allow you to reply to the Twitter user whom originally posted the article. Additionally, you’ll be able to see who else replied and retweeted. The Flipboard iPad app is great looking and has some fun interactions such as the page flips and article zooming. However, I’ve had a hard time finding myself to open it every day for my daily news reading. I still rely on my classic methods of reading my feed aggregators on iGoogle and going directly to some of my favorite sites. Flipboard for the iPad is still worth a look, it just might be your favorite way of flipping through the news. 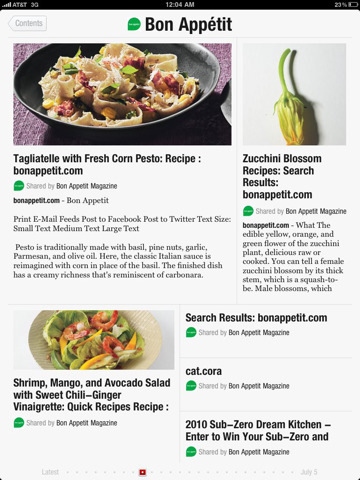 AppSafari review of Flipboard was written by Kyle Hayes on September 28th, 2010 and categorized under App Store, Featured, Feeds, Free, Fun, iPad apps, News, Reading, Social. Page viewed 7339 times, 1 so far today. Need help on using these apps? Please read the Help Page. Shame there is not a version of this for the iPhone. Needs to connect with google reader!